Output a drawing layout to a printer, a plotter, or a file. Save and restore the printer settings for each layout. Originally, people printed text from printers and plotted drawings from plotters. Now, you can do both with either. So this guide will also use the terms print and plot interchangeably as everyone else does. The command to output a drawing is PLOT and you can access it from the Quick Access toolbar. To display all of the options in the Plot dialog box, click the More Options button. As you can see, there are a lot of settings and options available for your use. For convenience, you can save and restore collections of these settings by name. These are called page setups. With page setups you can store the settings that you need for different printers, printing in gray scales, creating a PDF file from your drawing, and so on. To open the Page Setup Manager, right-click on the Model tab or a layout tab and choose Page Setup Manager. The command is PAGESETUP. Each layout tab in your drawing can have an associated page setup. This is convenient when you use more than one output device or format, or if you have several layouts with different sheet sizes in the same drawing. To create a new page setup, click New and enter the name of the new page setup. The Page Setup dialog box that displays next looks like the Plot dialog box. Choose all the options and settings that you want to save. When you are ready to plot, you simply specify the name of the page setup in the Plot dialog box, and all your plot settings will be restored. 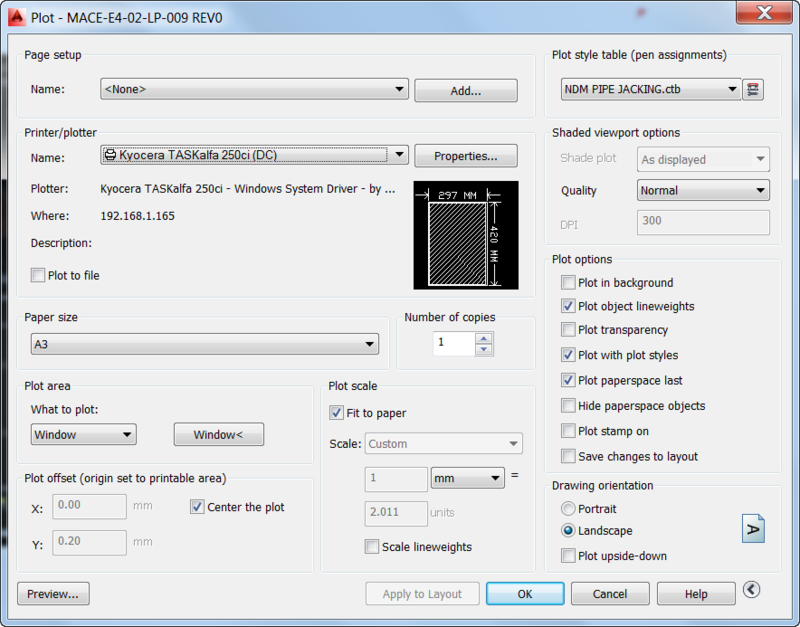 In the following illustration, the Plot dialog box is set to use the Hitchhiker page setup, which will output a DWF (Design Web Format) file rather than print to a plotter. Tip You can save page setups in your drawing template files, or you can import them from other drawing files. The following example shows you how to create a page setup for creating PDF files. Paper Size. The orientation (portrait or landscape) is built into the choices in the drop-down list. Plot Area. You can clip the area to be plotted with these options, but usually you plot everything. Plot Offset. This setting changes based on your printer, plotter, or other output. Try centering the plot or adjusting the origin, but remember that printers and plotters have a built-in margin around the edges. Plot Scale. Choose your plot scale from the drop-down list. A scale such as ¼” = 1’-0” is meant for printing to scale from the Model tab. On a layout tab, you normally print at a 1:1 scale. TipAlways double-check your settings with the Preview option. The resulting Preview window includes a toolbar with several controls, including Plot and Exit. After you are satisfied with your plot settings, save them to a page setup with a descriptive name such as "PDF-monochrome." Then, whenever you want to output to a PDF file, all that you need to do is click Print, choose the PDF-monochrome page setup, and click OK.